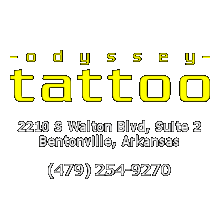 Odyssey Tattoo is a custom tattoo studio located in Bentonville, Arkansas, serving Northwest Arkansas since December 2005. We believe you deserve the best tattoo work done in a professional, relaxed environment. Our studio offers a clean and safe environment which exceeds all rigorous Arkansas Department of Health regulations. You will not find tattoo flash hanging on the walls of our studio. Instead, let one of our experienced artists—each who has their own styles and specialties—develop your concepts into a unique art piece designed to your individual specifications. We take your ideas seriously, and we treat you the way we would want to be treated: with respect.